Friday night, my friend Justin and I decided to have a walking dinner at the Raohe Street Night Market (饒河街觀光夜市) in Songshan. It's an easy walk from Xinyi, the neighborhood where I'm staying in Taipei. In fact, during my daily wandering around the neighborhood, I had run across it in the daytime on my way to the river, which is just north of the market street. It didn't look like much during the day, because all the booths and shops are closed down, but at night it turns into a pretty exciting stretch to walk through if you're hungry for food or looking for neat shops to browse through. If you want to shop for clothes, Wufenpu is a huge clothing market in the same area. 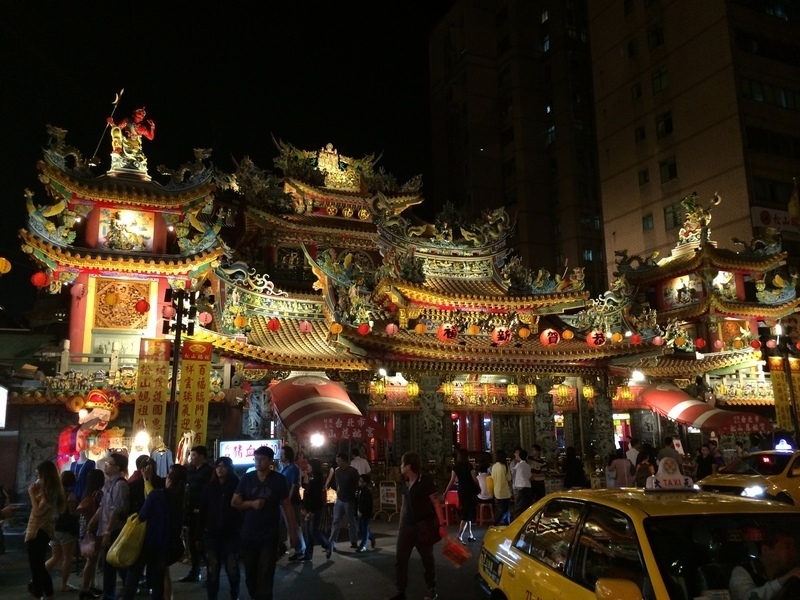 The market itself stretches down one street, with the very pretty Ciyou temple at one end.